More excellence in my chawan today as I tasted two more quality matchas from Sazen tea. In my last post I compared Organic Matcha Kin and Matcha Homare-no-Mukashi, so I thought it was only fitting that I compare another organic blend with another high quality matcha. Today’s pair are the Organic Matcha Gin and Premium Narino. Right off the bat, I knew both of these matchas are stellar. Opening both package my eyes were dazzled by the enticing vibrant emerald green color. After sifting easily, however, the Organic Gin appears a tad darker, yet still vivid and bold. The aroma of each of these gems was fresh, sweet and a bit floral, and both whisked into a creamy broth, although the Organic Gin had a few larger bubbles and more foam. The taste is where these two excelled and differed. I was seriously surprised by the smoothness and creaminess of the Organic Gin. With only a tad bitterness, certainly less bitterness than the Organic Matcha Kin I reviewed last week, the umami flavor lingered longer than I anticipated. I was impressed… then I sipped the Premium Matcha Narino. This elixir slowly cascaded across my tongue, sparking waves of tingling along its path. Absolutely no bitterness whatsoever and a finish that remained for several minutes after my chawan was empty, most likely due to the fact that this tea is shaded for over 50 days to help produce its enticing umami quality. The quality of this matcha is exceptional and unequaled among matchas I have compared from Sazen thus far. Intoxicated by this tea, I had to learn more about this remarkable tea, and fortunately, Sazen shares the details. As the story goes, Narino matcha is grown in the Okunoyama tea garden in the Uji area, which happens to be the only remaining tea garden of the original seven distinguished tea gardens in the area during the Muromachi Period (1338 - 1573). Okunoyama garden grew over 1000 various indigenous tea plants, yet in 1981 they began a mission to grow the finest Uji Tea possible to pass down to future generations. This lead to extensive selection, tasting and research on their cultivars. Starting with 53 kinds, in 1994 they narrowed their selection down to only 2, “Narino”, the matcha I tasted today, being one of them. In 2000, the tea garden submitted these two kinds of tea with The Registry of Plant Varieties, and 2 years later their Uji teas were registered. 8 years later in 2010, Narino became recognized as the number one matcha in Japan by receiving the Minister’s Award from the Ministry of Agriculture, Forestry and Fisheries. Because Narino matcha is a single-breed, non-blended matcha, production is limited since on a specific amount can be harvested every year. Furthermore, the tea garden painstakingly decides whether or not the harvest meets their quality standards. If it does not, Narino will not be sold that year. Fortunately for me, 2018 was an exceptional year. Overall, both of these matchas are wonderful. The Organic Gin would make an excellent choice for daily consumption. But if you only looking for an unequaled matcha steeped with a rich history from a tea garden dating back hundreds of years, look no further than Narino matcha. You will not be disappointed. While I continue to be an advocate for organic and sustainably farmed tea, I do eagerly partake in some highly prized matcha, which is often not organic. Craving koicha before meditating on this particularly sunny spring Seattle morning, I decided to compare 2 of my 5 recently purchased matchas from Sazen, Tea Market Place from Kyoto - one organic and other other not. Matcha Homare-no-Mukashi has been touted as an award-winning, excellent choice for a thick koicha and I have to agree. I opened the tin to an enticing vegetal fresh scent, initiating my mouth to water. The color of this powder is vibrant green and sifted easily into my chawan. The tines for my chasen gently whisked it into a creamy, thick emerald body with a lovely, smooth texture with full foam. Then came the taste… amazing!!! Smooth and rich, without a hint of bitterness, and a delicious umami finish that remained on my tongue long after my chawan was empty. According to Sazen this matcha is made from “blending 100% of tencha leaves harvested in Horii Shichimeien’s own tea gardens.” As I paused awhile to experience the continuing ripples from Homare-no-Mukashi, I felt my entire being drop into a gentle state of calm, alert presence. What a gem! I love this matcha. Next up was the organic Matcha Kin. On first inspection the color was slightly less vibrant, and the aroma was a bit duller in comparison. However, it sifted easily and once whisked produces a gorgeous and inviting thick, deep green elixir which I found more vibrant than the Homare-no-Mukashi koicha. While less sweet, this matcha easily hold its own, especially for an organic blend. A grassy bitterness remains after the initial wave of sweetness and umami fade. Still it is far from tart and cloying, and also invites a release and gentle exhale as you sit with experience after each swallow. For an organic tea, I would definitely consume this on a daily basis. Doesn't the organic matcha kin look like a deeper emerald green? I have a few more matchas to try from Sazen, and I eager to taste them. If you are interested in high quality matcha, go visit Sazen today. You won’t be disappointed. Interesting article to appear in Medscape, Drinking Tea: Are the Health Benefits Real? While it concludes, as do most reports on the health benefits of anything other than medications, how more studies are still needed, the article does cite some specific merits of tea. Of course, reading the article with a focus on the advantages of green tea (and hence, matcha). the authors do note how the abundant polyphenol in green tea,, epigallocatechin, may demonstrate healing properties by preventing oxidative damage, thereby potentially lowering the risk of cardiovascular disease, heart attacks, strokes, brain hemorrhages and clots, and elevation of LDL cholesterol, although, some researchers suggest, reduction in coronary heart disease may be in women alone rather than men. Newer research has suggested that polyphenols may have other benefits such as protecting against neurogenerative diseases, such as Parkinson disease, cancer, and kidney disease. Green tea may keep teeth and gums healthy by preventing the growth of bacteria associated with periodontal disease, decreasing inflammation, and preventing bone resorption. And of course I was please to read how matcha, with its high level of the amino acid L-theanine may reduce the effects of stress. The authors do mention that the caffeine levels in green tea and matcha have an antagonistic effect on L-theanine, which may, in turn, negate this relaxing effect, although personally, I tend to experience a calm, yet alert, effect from most of my matcha. What is not addressed in this article is the ritual of tea and how this use may impact our mind, body, heart and soul. Rather than reduce tea down to its chemical constituents, perhaps medicine might reflect on the healing power of ceremony. What healing comes from sitting down with a friend over a cup of tea or whisking your morning matcha before sitting in meditation or doing breathwork? This is what I would love to see come next when talking about the healing benefits of tea. Well, my first gift for this Chanukah 2018 was perfect for me - a brand of matcha (and company) that was new to me - the organic The Matcha from CAP Beauty. Of course, the label is the first thing to catch the eye, and I find it just plain uplifting, making me smile. The red label on the side of the tin says, “Drink it in. Begin within.” That accurately sums up my meditation and matcha practice - make matcha and meditate. Well, the meditation actually begins with the making of the matcha. 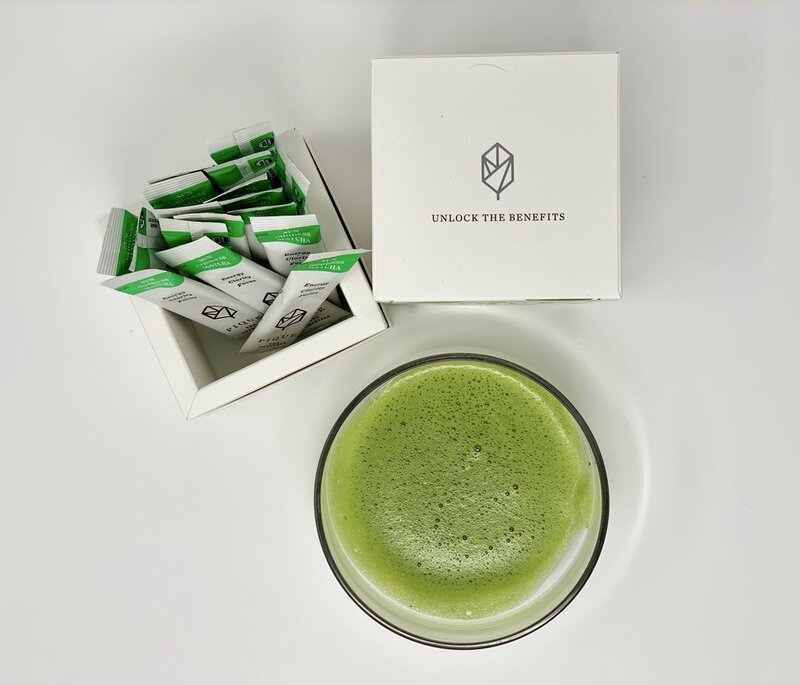 How matcha goodness is contained within this tin - that would be “29 grams of High Vibrational Focus.” Who can argue with that? For an organic matcha, this one is fairly good. The matcha sifts nicely, and is a lovely bright green, though not as vibrantly emerald as I have seen in many non-organic brands. 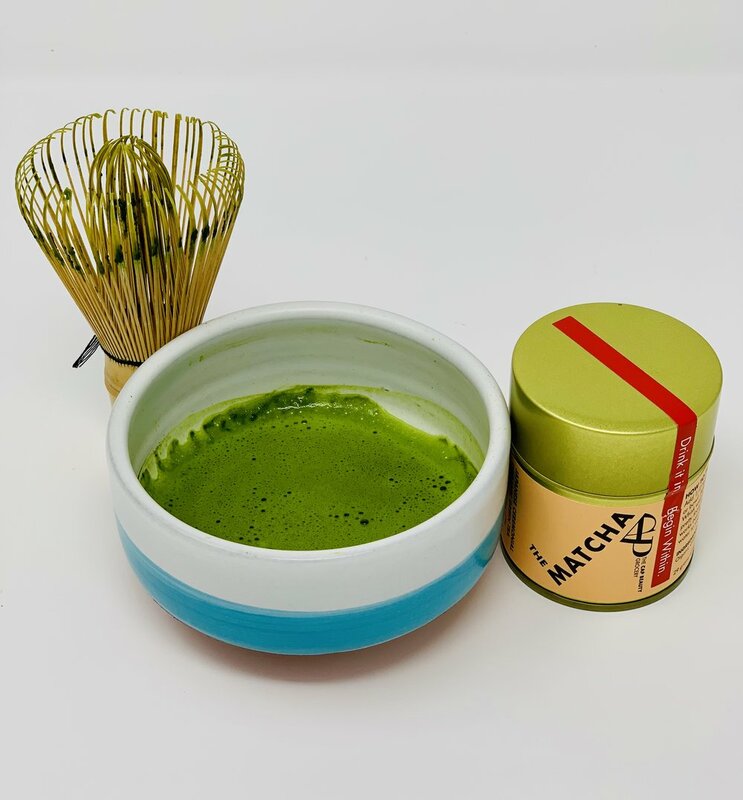 My koicha whisked easily into a thick and creamy elixir, while the addition of more water to whisk an usucha produced a bowl with a thin layer of foam with sparse bubbles. The aroma was fresh and grassy. The texture was very slightly gritty, but not unpleasant at all. I did prefer the flavor profile of the koicha to the usucha, yet despite the slight bitterness common with organic matchas, this dissipated quickly to leave a umami finish that lingered for quite some time. The overall flavor was clean but not very sophisticated or complex. For an organic matcha, I readily recommend it. Once you explore their website, you might find yourself purchasing other products, as I did. I just couldn’t resist ordering their matcha coconut butter. For me, every day begins with a meditation and matcha moment (well, that is, after the cats have been fed and petted). My intent on this Thanksgiving was to do an extended gratitude meditation, giving thanks for all the people and experiences in my life. 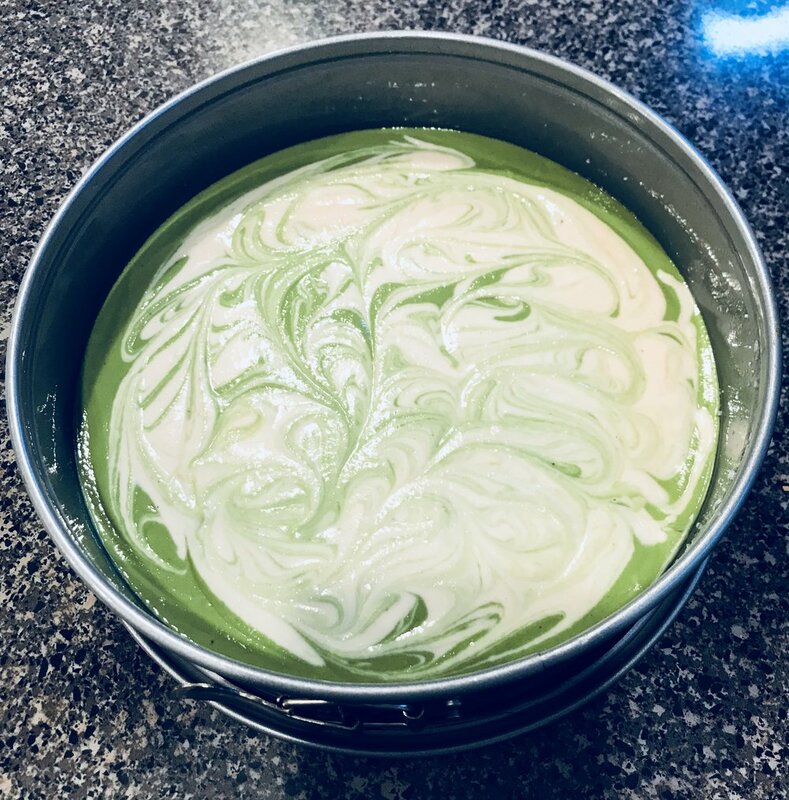 This began when I acknowledged how fortunate I am to not only be writing this blog, but to have the opportunity to meditate and drink matcha in the safety and serenity of my own home. I hope to never take that for granted. Before sitting on my cushion to practice opening my heart, I opened my new package from Mizuba Tea Company. I discovered Mizuba through their trademark saying - Take a #matchamoment. I clicked the link to their website without a moment’s hesitation. On a quest to discover the best tasting organic matcha available, I had planned a purchase, yet landing on their chawan page, I was a goner. My whole being brighten and smile erupt on my face seeing a vibrant yellow chawan. Before I knew it, four matchas managed to make their way into my shopping cart along with that yellow bowl. For my morning meditation session, I began with their organic ceremonial Yorokobi matcha. Their description echoes my sentiments. Most organic matchas, as I have discussed previously, tend to be bit bitter and astringent, making the overall experience less than a enjoyable. The translation for yorokobi is “joy” and as the name suggests, this matcha delights. The color was a vibrant green and whisking it lead to a think foam like froth. The aroma had a floral note. Today I whisked a thick, creamy, and velvety smooth koicha with nice umami finish. My senses awoke to the taste and I felt a soothing calm embrace as I sat down to give thanks. After appreciating my loved ones and cats, my students and patients, my colleagues and friends, my thoughts turned to all the hands that touched this matcha from the moment the seeds were planted to this very well designed package on my counter. How many hundreds, if not thousands, of people were involved? And I hadn’t yet gotten to the chawan. Thank you all for enriching my life. Throughout the rest of day, I managed to try all the other matchas I received. Two others were also organic, the Nagomi and the House matcha. The Kokoro was not organic, but was just as smooth as the Yorokobi. It whisked quickly and to a full-bodied froth. This one was a even a bit more creamy and richer with a smooth chocolaty flavor. The organic Nagomi was delightful with a nuttier flavor and a clean umami finish that lingered on my tongue quite awhile. The description on the website for the organic house matcha talks of adding honey and pouring over ice (something I never do), and I know why. As a bowl of matcha, this was rather disappointing in its grittiness and bitterness. Most likely, I will use this for matcha lattes and cooking. Did I mention how this yellow chawan delighted me? The color is enticing, as I have never seen a bowl this hue. I feel sunshine looking at this bowl, and the contrast of green and yellow is energizing. The glaze has a lovely thickness to the texture, not glossy. The size is perfect - not overly large as many chawan can be, as it fits neatly into your hand. I love this bowl and may buy a few more (oh, yes, for gifts, sure). On this Thanksgiving, I was thrilled and thankful for finding these gems. If you are looking to take a (organic) #matchamoment, visit Mizuba today, and see if you can avoid temptation of buying a new chawan. I highly recommend the entire experience. Screened for toxins and pesticides. A few weeks ago, I came across Pique Tea and my curiosity was definitely piqued. What I found most appealing was their attention to quality and purity. 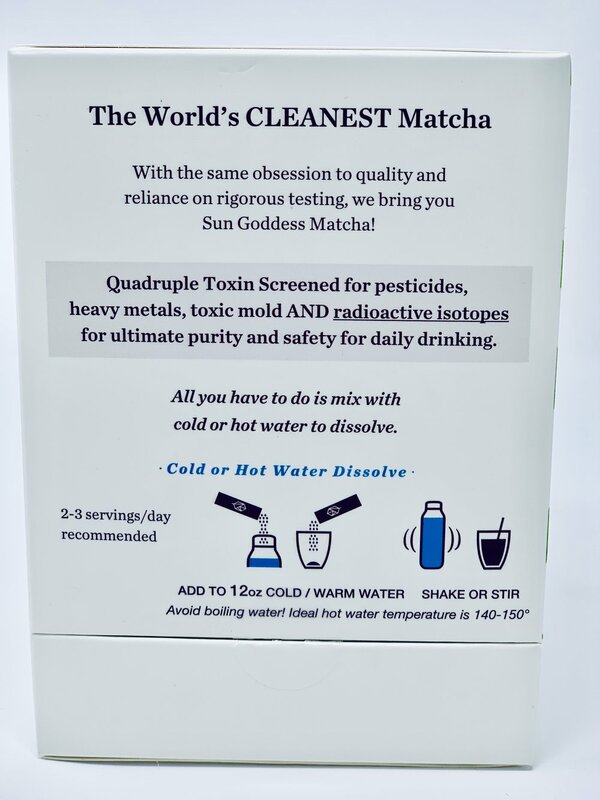 According to their website and labeling, Pique tea is screened four times for toxins - pesticides, heavy metals, molds, and radioactive isotopes. As a naturopathic physician who cares about health, the quality of my food is important. And as someone who consumes his fair share of daily matcha, I believe attention should be paid to what potentially hazardous substances might find their way into my bowl, especially after the study recently published on October 22, 2018 in JAMA suggested that people who consumed mostly organic fruits, vegetables, dairy products, meat and other foods had 25% reduction in several cancers compared to adults who never ate organic food. Why should this concern extend to my tea? While I prefer organic matcha from a ethical, moral and health perspective, several brands I have tasted were lackluster in color, less vibrant and intense, poorly whisked, more bitter and missed any significant umami finish. Needless to say, I was wary. Still, I ordered three teas - sencha, rooibos and matcha. Both the sencha and rooibos arrived quickly, but a mix up in delivery had me waiting an additional week for the matcha, but after tasting the tea that had arrived, my enthusiasm was waning. Pique Tea uses only the highest quality organic teas that are screened for toxins as mentioned above. Then they use their patented cold brewed crystallization process to convert the tea into crystals to which you simply add water. First their teas are brewed for up to 8 hours at low temperatures to extract their naturally occurring phytonutrients. Next the water is extracted from the brew to form the most potent and nutritionally rich crystals. These are then packaged in the small serving sized packets for quick and easy use, ensuring that you can indeed have your daily cup of tea wherever you go. As stated on their mission page of their website, in today’s fast paced world, not everyone has time to brew loose leaf tea. This is where I had to gasp! Why not? I have three offices - a private practice, an office at my university’s clinic and one on campus. Then of course, I have my home. In each of these places I have a kettle and teaware. I know, I know! I am an exception. For me tea is not about the physical medicinal aspects that are touted all over Pique Teas website. Tea is a meditation. Tea is a ritual. Tea is an art form. While I am in favor of people switching to organic, toxin-free tea as a physical health practice, let’s not overlook taste and the ritual. That said, a part of me remained curious about these crystals. Even though I could never imagine abandoning loose leaf tea, perhaps, I wondered, having an easy to carry packet of tea could come in handy, for instance, when if traveling. It would be much easier than my habit of scooping sencha and gyokuro into those bleached tea bags, then finding a container in which to put said bags so they don't spill all over my bag (something that has happened on more than one occasion). Okay, I was intrigued… until I tasted the sencha and rooibos. This is like comparing apples and oranges… or Assam to Gyokuro. They do not compare, and keep in mind, the intent behind them is vastly different. As you can see with the sencha, the crystals are a bright yellow, not a mellow green I anticipated. The taste was far from smooth, with a bit of a grit to it, not surprisingly since I mixed these crystals with warm water. The rooibos was…interesting, but uninspiring to me. One use I could imagine was in cooking and baking, but even though, I do not think they would capture the flavor I desire to infuse in my food. Needless to say, I was less than hopeful for my matcha, failing to think about the fact that matcha is a powder, not loose leaf tea. Perhaps it would be ground, powdered matcha. A week later, my shipment arrived and I was…surprised and delighted, so much so that I ordered 2 more boxes. When I emptied the packet into my chawan, I was surprised by the bright green color. The aroma was fresh and clean, not stale. I chose not to sift it, and that may have contributed to the slightly gritty quality on the tongue. But here’s the thing - this was not at all unpleasant. In the past when a matcha had a graininess, a bitter note followed. Not here. To check this, I tried several brands to compare and taste, and I hardly detected any bitterness. I tend to prefer koicha to usucha tea, so I made both. With minimal water Pique matcha whisked into a rich, thick, smooth tasting (despite the slight graininess) elixir. Whether thin or thick, whisking yielded a thin layer of foam with tiny bubbles, and creamy flavor with a nutty, chocolaty note. And yes, there is an umami finish that remains on my tongue. I find Pique matcha… well, remarkable. Am I being swayed by the fact I know this is one of the cleanest, purest matchas around? Perhaps. Still I like it and am going to order more. My only wish - sell your matcha in larger, glass, containers to be bit more environmentally conscious! Thank you Pique Tea for caring about our health! 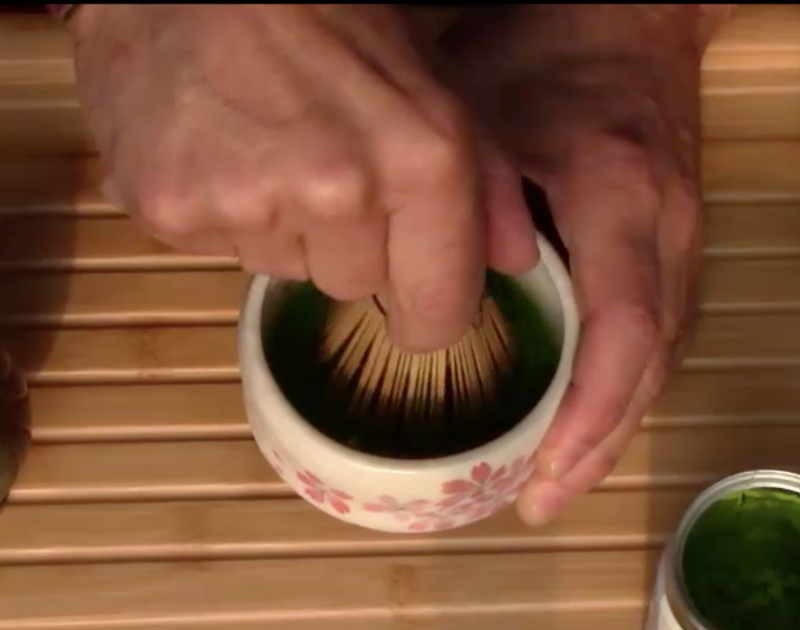 A few days ago I posted a video entitled the Importance of Ritual and Matcha Making, in which I was sitting on my deck on a clear Seattle morning, capturing the my process of sifting and whisking my chawan of matcha before sitting down to meditate. Imagine my surprise when I find an email from one of my favorite magazines (sadly now only online), Scientific American Mind, declaring how any simple ritual can improve overall self-control. To add to my delight, the image was of a hand whisking a bowl of matcha. I guess science has now proven what we in the tea and matcha tribe have known all along - our daily ritual can improve our life. One of my favorite classes to teach at Bastyr University was Myth, Ritual and Health, where we explored the power of both stories and rituals to influence, shape and heal our lives. During class, we took a closer look at our daily routines, and considered how to elevate our unconscious, mindless habits to the status of ritual, thereby infusing them with meaning and purpose. Together, the students and I soon discovered that the key is not what we do, but how we do it. For example, consider something you might do daily, like taking a shower. How do you take a shower? If you add it all the minutes, how much time have you spent bathing? And during all that time, how present were you? This, of course, begs the question, how present would you like to be in your life? Rather than mindlessly rushing through the process, you could engage fully in the moment by embracing all your senses: the feel of the water as moves across your skin, the fragrance of the soap, the texture of the towel as you dry off. Or you might meditate on gratitude: for the clean water itself, for the access to water, for the time and safety to bathe, for all those people who had a hand in ensuring that when you turned on the facet, fresh water spilled forth. Rather than viewing each activity as tasks to check off our list (a formula for stress), what if we were to have respect for every minute of our lives and honor each daily experience by showing up for ourselves in the present? How can you add more meaning and purpose into your daily life? Which daily habits would you like to elevate to the status of ritual? I believe in the power of ritual. Most of modern life seems to be collection of leaping from one event to the next, often while doing something else like texting or checking one's schedule, preventing us from being present to the moment, missing our transitions and goodbyes. I am so appreciative that my daily morning ritual begins with matcha. While much shorter than a traditional ceremony, I still manage to practice patience and presence. I don't use a kama or a furo to hold the water. I don't use my hishaku to pour the water into the chawan. However, my process is still meditative, reflective and intentional. I sift the matcha slowly, pushing it through the strainer rather than scraping. Yes it takes time, but I try to be with the matcha. While whisking, I silently recite my morning intentions and prayers, infusing my elixir with meaning and purpose. Then I arrive at the rich and complex sensations which come from the first sip. Meditating on the physical sensations of taste is a wave that lasts for several minutes. Then I sit. How much of our day is spent mindlessly moving from one event, task, conversation or connection to the next without honoring the process or the people involved? Make some matcha, have a cup of tea. Take your time and savor the moment. Practiced daily, perhaps it will change your world. One of my biggest challenges with mindfulness practice involves mindful eating. As any good East Coast, Jewish boy might do, I'd like to blame my father, although I know this is highly unfair. If memory serves, and I truly doubt my memory, I recall my father reaching over with his fork, stabbing the tomato off my plate. As he would place it in his mouth he'd say, "You weren't going to eat that, right?" Is this a real or fabricated memory, I am unsure. At that time, I know I didn't care for tomatoes, but that is not the point. My father was a fast and furious eater, and as is the case with me, I don't believe he chewed his food but swallowed it whole. Like father, like son. So today, that is the narrative I use to justify my mindless and hurried eating. I have lead the mindful raisin eating exercise dozens of times in workshops and classes. In that setting, I can easily direct my attention and experience the raisin in a luxurious, slow-full way. An hour later at the table for a meal, all of my hours of mindful practice fly out the window. When it comes to matcha, on the other hand, I can take my time. Every day, my daily meditation practice, in whatever form, begins with a mindful matcha drinking session. Can this carry over to matcha infused foods? 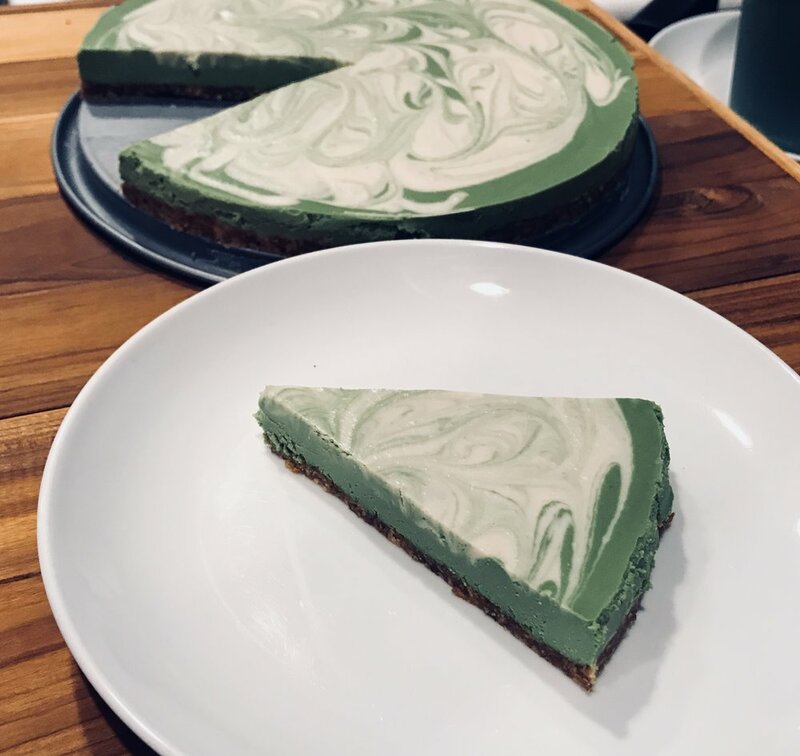 Finding a recipe for vegan matcha cheesecake was an excellent opportunity to practice mindful eating, as well as gratitude. I am so appreciative of how my friends acknowledge and perpetuate my love of all things matcha. The other day, my good friend, Sarah, sent me an amazing recipe from Nom Nom Paleo for a truly delicious vegan, paleo, matcha cheesecake. With cashews as the base, I couldn't believe this delicacy was vegan! So how mindful was I? On one level, I believe I savored every savory bite, riding the waves of flavorful sensations. On the other hand, we did nearly eat the whole thing, continuing to indulge in our sensory pleasures. So I guess you could say, I was mindful of eating more than my stomach desired, but my dopamine receptors sure had a great time. Fortunately,, I had enough for a breakfast meal paired with a smooth and rich koicha with the same matcha as I used in the cheesecake! I couldn't bring myself to use one of the many culinary grade stored in my refrigerator, I wanted to use my old standby - ceremonial matcha from Encha Matcha, which only heightened this recipe. This is now one of my favorite desserts. I can't wait to play with the recipe, experimenting with new flavor like lime, lavender, and even chocolate. Try it - you'll love it. But see if you, too, can practice the art of mindful eating. Sitting on my meditation cushion after my morning matcha, I thought about how is is all truly about safety, isn’t it? When we don’t feel safe on any level - safe in our homes or with our families, safe at work, safe in our streets, safe with our government, safe at the doctors, and even safe with our own thoughts or in our own bodies - we are unable to feel happy, healthy and at ease. Our nervous system either shuts down and immobilizes or we activate and mobilize. Don't we all want and need to feel safe? The moment we realize everyone of us on this planet wants the same thing - to feel safe - the seeds of compassion can sprout roots. When we feel safe, we no longer feel compelled to control, dominate or belittle. Compassion never means condemning or condoning another’s actions, but rather recognizing their humanity and how the deep desire for safety drives all behavior. One person may believe a wall will make them safe, while another believes open borders and open arms are the answer. Only by connecting to the deeper motivation - the desire for safety - can we begin to forge a connection and build relationships, whether with others or with ourselves. In Metta Meditation we repeat the following phrases, sending loving kindness to all beings. Traditionally, we start this undertaking by focusing on a benefactor or loved one for whom we have nothing but the best intentions. As we progress, we eventually direct our heartfelt well wishes to those with whom we find challenging and difficult, which, of course, could include ourselves. But take a moment and consider this: if everyone on this planet felt safe - safe to be themselves, safe to express their thoughts and ideas without fear of judgment, safe to explore their creativity, safe to connect and love others, safe to exist - what would this world be like? So I invite you to try this - practice sending these heartfelt loving wishes to everyone...everyone. Even the people who irritate or upset you. Even the people with whom you disagree about well... anything. If everyone felt safe, happy, healthy and felt at ease, what might be the state of this world? Hello! My name is Brad and I have a passion for meditation and matcha. Those questions above are the focus of one of my newest finds - Matchagi based out of Atlanta. 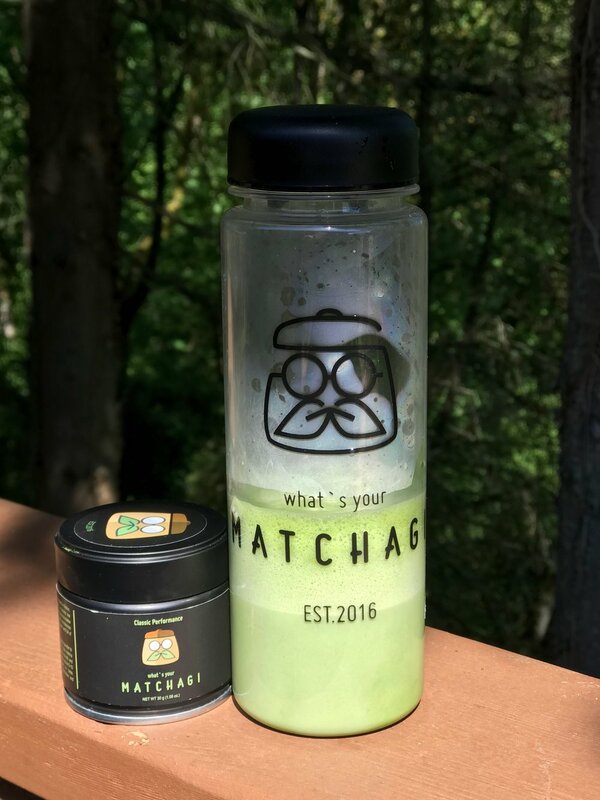 Formed two years ago, Matchagi has the goal of helping others find and fuel their passions through the power of matcha. This week I had the chance to speak with one of the co-founders, Cal Supik, who shared with me the meaning behind the name. A gi refers to the uniform worn in karate and other martial arts disciplines. He describes the serious practitioner who wakes every morning to don their respective uniforms, their respective passions, their respective gi. Each of us have our own gi we wear, and Matchagi wants to help each of us cultivate that passion. About two years ago, Cal was working as a developer for a large company and trying to find energy anywhere he could. Having been a college athlete, he was familiar with many of the sports and energy drinks, yet he wasn't interested in all the "extra" ingredients. There was never enough time in the day, or enough Red Bulls to drink, to keep going. He wanted something different. When his future business partner, Arya Suprayogi, introduced him to matcha, he knew he found the answer. As Cal says, Matcha contains a dynamic duo - the best of both words - L-theanine plus caffeine. You get the calm and focus from the theanine AND you get the energy from the caffeine! They formed an LLC and flew off to Japan in search of a ceremonial grade matcha affordable to everyone. What they offer is Matchagi. Mostly on the internet, Matchagi can also be found in a few nutrition stores and juice bars in the Atlanta area, but they are hoping to expand. Looking on their Instagram page, it is easy to tell that Supik and Suprayogi have an athletic passion. Photos show people engaged in all kinds of activities - weight lifting, biking, hiking and more, carrying a Matchagi bottle. Not to be left out, I added some homemade cashew milk to an usucha, shook vigorously, and took my bottle outside to sip on my yoga mat. Yes, I LOVE the concept behind Matchagi. But what about the matcha itself? The color of the Matchagi is a rather flat yellow - green, and far from the deep, vibrant emerald that I have come to appreciate in much higher end matchas. With whisking yields a light foam with smallish bubbles which tend to disperse if you let it sit for a moment. The aroma of matcha can make me salivate instantly, but this was not the case here. The smell was a bit stale and nutty rather than like fresh cut hay or seaweed. As the first sip hit my tongue, the texture seemed a tad coarse, with an earthy, bitter flavor permeating. However, if you sit for awhile and observe the sensations on your tongue, a subtle finish emerges once the bitter note evaporates. As I sat in meditation after my usucha, I was struck by the lingering umami that showed up. For my daily morning mindfulness ritual (that begins with the preparation of my matcha followed by sitting meditation), I prefer a higher end ceremonial blend. However, my Gi, my passion, extends beyond this morning matcha routine. My Gi is for mindful living and activities that foster this - yoga, reading, conversations with friends, music, theatre, writing, etc. And, in my humble opinion, all of those experiences are improved with tea and matcha. To this end, I found Matchagi to be perfect for making matcha lattes (especially with homemade cashew milk). To assist patrons in their pursuit of their gi, Cal and Arya offer a thin plastic bottle so you can take your Matchagi with you with a simple instruction card. It shows you how to add the matcha with some ice and cold water in the bottle and shake vigorously. In learning about the message of Matchagi, I feel like I found kindred spirits. If they can introduce more people to matcha as an alternative to sports drinks without additives and chemicals, how wonderful! Keep your passions alive, Matchagi! I will continue to support you. I haven't been to Victoria in almost 15 years, so when the chance arose for a romantic brief getaway during a three day weekend, I jumped at it. Little did I know that the passage on the Victoria Clipper from downtown Seattle to the inner harbor of Victoria would be fraught with nauseating turmoil. I will spare you all the details of a ferry full of sick people. Needless to say, I spent an intense two hours in focused concentration, just trying to breathe! Thankfully, the ferry docked in one piece, and we all scrambled to disembark immediately! Alive and still breathing, it was a quick walk in the rain to our hotel. Settling our stomachs by taking time to settle into our room, three hours later I was eager to discover the matcha in the city. Only 7 blocks from our hotel in the brisk cold, I found Just Matcha Tea Shop, although I had a bit of trouble spotting the signage. This location, on Pandora, is just one of two of their places of operation. I was delighted to find that they offer several grades of matcha, plus a variety of flavored and seasonal matcha lattes. Of course I had to start with a premium ceremonial grade served in a classic and beautiful chawan (so glad they served matcha in bowls rather than glassware!). This was lovely, but a bit thin, and I longed for a bit more complex vegetal umami and longer finish. But the color was rich and green. Since I was here I had to follow this with a chocolate latte using one of their lesser grade matchas (why waste the good stuff, right?) and almond milk. Nice for a treat but if I’m going to get a flavored matcha drink I guess I need three times the matcha serving. Just Matcha had a great assortment of bakery items that where also gluten-free, but not dairy-free as well so I passed on these. I do want to return to look at the gorgeous handmade chawan. I know Victoria is known for British high tea (going to Empress tomorrow) but there are several places for us matcha lovers! Check this place out! Second trip to the teashop and met the owner, Kip, who graciously indulged me in my desire for koicha, making me a delicious, rich, smooth and creamy bowl using their premium blend. This matcha had a lovely finish with only a slight bitterness! This was heaven, motivating me to immediately buy both their shincha and platinum grade matcha blends. Over matcha, we talked about his experience with matcha and owning a teahouse. This is what a love - good tea and conversation. Thank you, Kip, for the koicha, matcha and the conversation! I can’t wait to make these at home.